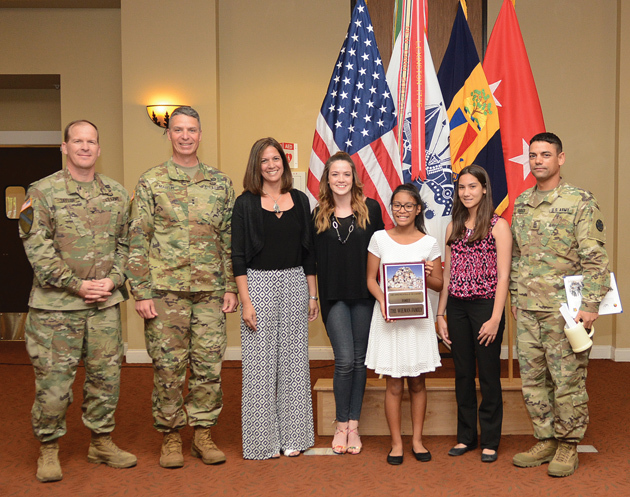 The Wieman family receives the Volunteer Family of the Year Award from Maj. Gen. Joseph Martin, Col. Scott Taylor and Command Sgt. Maj. Edison Rebuck. They are the children and spouse of Col. Jason Wieman, commander of MEDDAC. Mrs. Wieman also received a Presidential Volunteer Lifetime Achievement Award. 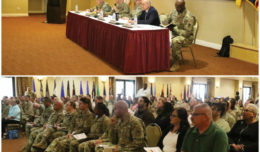 The National Training Center and Fort Irwin recognized approximately 60 community members who served as volunteers during a ceremony here, April 25. The volunteers were honored in various categories and were the finalists from 278 active volunteers from this installation, according to Ray Johnson, installation volunteer coordinator with Army Community Service. Active volunteers provided more than 42,000 hours of their time to approximately 40 organizations from April 2015 to April 2016. 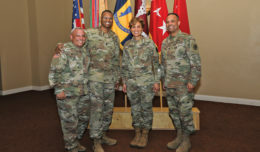 The NTC command team of Maj. Gen. Joseph Martin and Command Sgt. 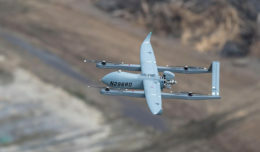 Maj. Edison Rebuck, along with Fort Irwin United States Army Garrison Commander Col. Scott Taylor and Mrs. Susan Taylor, presided over the ceremony and the presenting of certificates, medals and mementos. Mrs. Taylor served as guest speaker. Mrs. Taylor spoke about her early years as an Army wife and leaving a job to focus on volunteering. It was then she caught the “volunteering bug.” She expressed that the connections she has formed while volunteering has been one of the most rewarding aspects as a military spouse. United States Army Garrison Commander Awards – Andres Janoe, Rosalie Farris, Kenneth Paull, Walter Blackman, Jason Farris, Frances Gutierrez, Alma Estrada-Hernandez, Yesenia Byrne, Timothy Camacho, Carlos Bustamante, George Cordova, Patrice Garrido, Kirk Dahlke, Gabriela Egan, Sydney Norris, Ariel Paull, Amelia Janes, Erendira Cortez, Margaret Gines, Andrea Johnson, Jamerson Nava, William Talton, Kimberlyn Hunt, Chadd Breit, Laura Kornacki, Wendy Lai, Violet Noyes and Mike Morrero. NTC and Fort Irwin Volunteers of the Year for 2016 – FMWR Volunteer of the Year – Vanessa Hartmann; Army Community Service Volunteer of the Year – Sylvia Dihle; Religious Support Volunteer of the Year – Christy King; Volunteer Family of the Year the Wiemans; Active Duty Volunteer of the Year Capt Michelle Shimko, MEDDAC; Family Readiness Group Leader of the Year – Colleen Mason, 2nd TC; MEDDAC Volunteer of the Year – Sonja Morales; Private Organization Volunteer of the Year – Military and Civilian Spouses Club; Youth Volunteer of the Year – Victoria Wieman; Operations Group Volunteer of the Year – Chrystal Cunningham; 11th ACR Volunteer of the Year – Jodi Anderson; 916th Volunteer of the Year – Jeni Croteau; Fort Irwin Scout’s Volunteer of the Year – Chance Lowe. The United States President’s Volunteer Service Silver Medal – Adriana Rodriguez, Malissa Celeen, Jared Dahl and Patricia Pina. The United States President’s Volunteer Service Gold Medal – Ada Bustamante, Faith Stephens, Jamie Julien, Jodi Monroy, Kelly Furtick, Shannon Simpson, Sonja Morales and Tina Williams. Groups/families/teams – Fort Irwin Sergeant Audie Murphy Club. Presidential Volunteer Lifetime Achievement Award – Delilah Wieman, Lifetime/Complete Coin and Kelly Lesperance, Lifetime/Complete Coin. 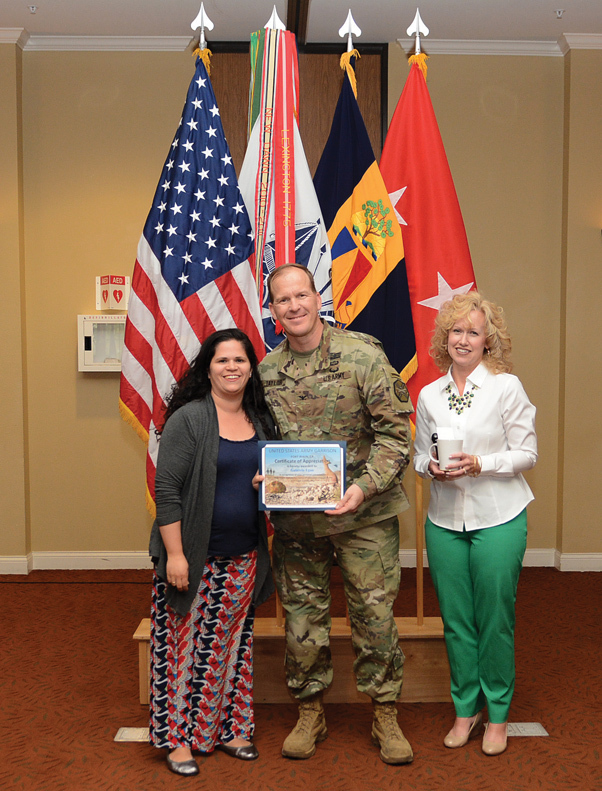 Gabriela Egan receives a United States Army Garrison Fort Irwin Commander’s Volunteer of Excellence Award from Col. Scott Taylor and Mrs. Susan Taylor. 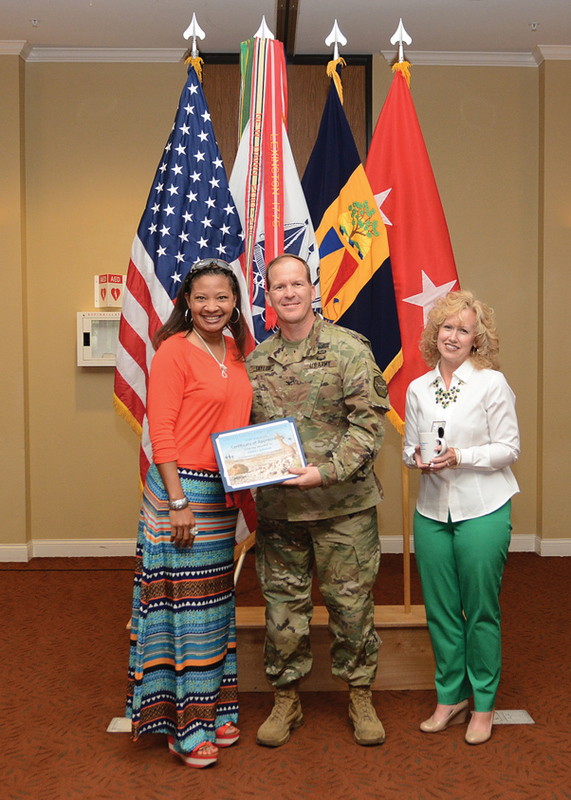 Andrea Johnson receives a United States Army Garrison Fort Irwin Commander’s Volunteer of Excellence Award from Col. Scott Taylor and Mrs. Susan Taylor. National Training Center and Fort Irwin Commander Maj. Gen. Joseph Martin pins on the collar of Capt. 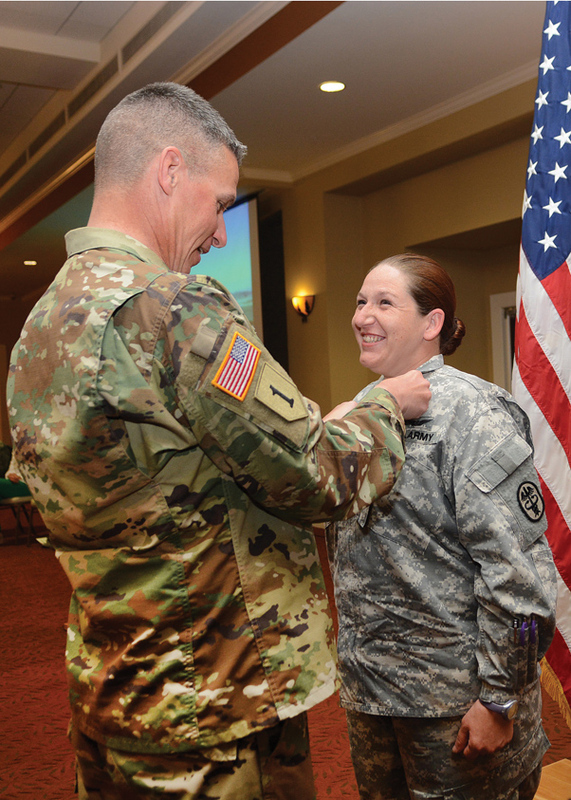 Michelle Shimko a Military Outstanding Volunteer Service medal. 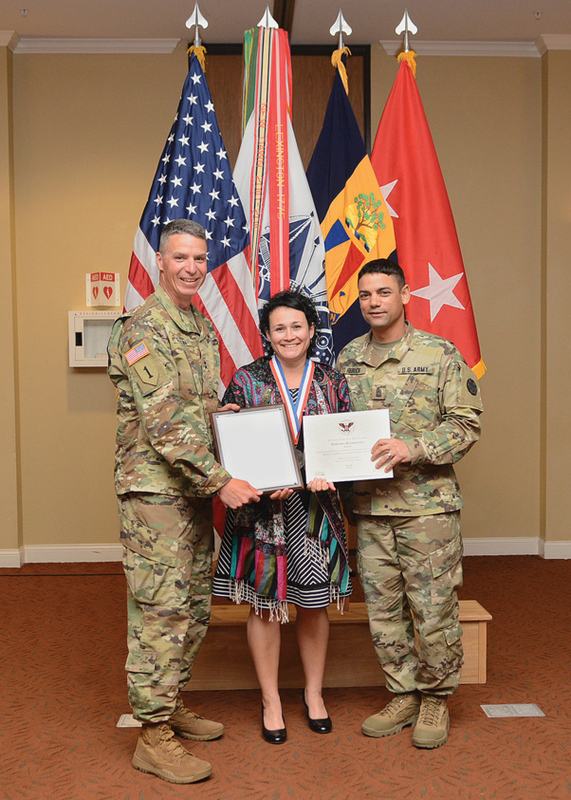 Adrianna Rodriguez receives the United States President’s Volunteer Service Silver Medal award from Maj. Gen. Joseph Martin and Command Sgt. Maj. Edison Rebuck.